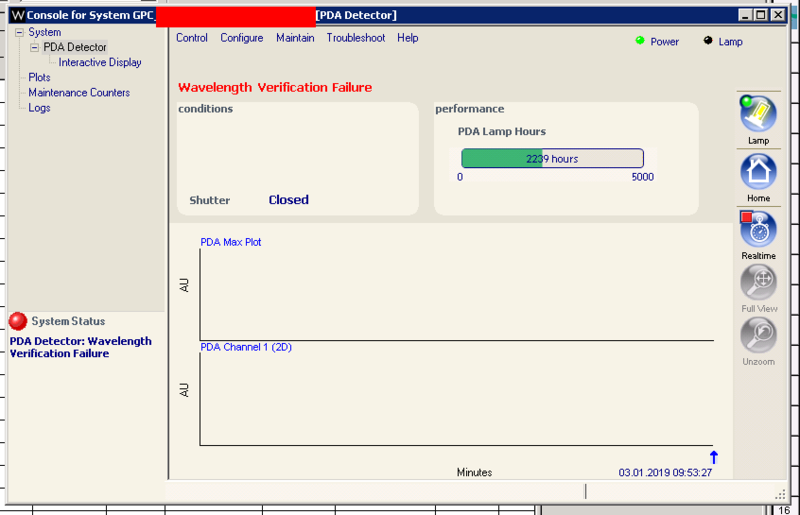 Hi everyone, this is the first time I'm seeing this error on my PDA detector, does anyone know how to troubleshoot this? Thank you for your input! "unless the pda got dropped on its head, it is very unlikely that you would get out of calibration for mechanical reasons. however, if one of the troubleshooting diagnostics failed you might generate this kind of error. I would start to "fix" this with the following sequence of actions -- you will note that they progressively require more time. first make sure that the flow cell is filled with water -- if there's a bubble trapped in the flow cell all bets are off. I'd pump water through the cell for 5 or so minutes to ensure that it really is filled with water. Step 1.	reset the detector from the Control menu. that should result in applying the stored calibration values to the detector. Step 2.	cycle the power to the detector -- this will force a re-initialization and wavelength verification comes along for the ride. all of the next steps should involve someone from GSS to sort through the mechanical and firmware possibilities." Additionally, you may just need a erbium calibration. However you should make sure you have a D2 spectrum.